I was recently sent the Baby Jogger City Go car capsule to review! I was also sent a Baby Jogger City Mini GT to pair it with to be able to use and discuss it as a total travel system. 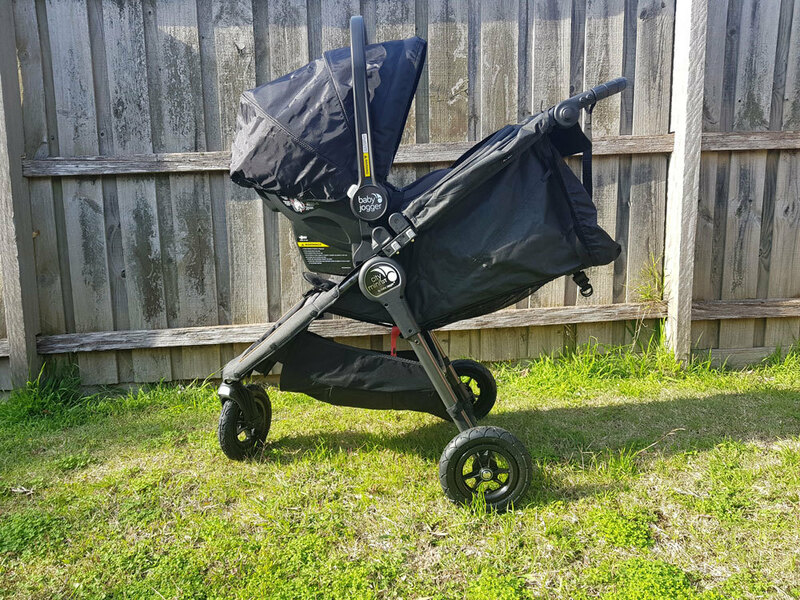 And you can read the full review of the Baby Jogger City Mini Gt here and I’ll pop the video review at the bottom of this page! Firstly, I have to admit, car seats aren’t really my “thing”. I’m all over prams. I’ve review dozens of prams. But I don’t have a lot of experience reviewing car seats. Though I do have one recent article I wrote about fitting three seats across the back of a small car. So firstly I want to tell you the thing that I love the most about the Baby Jogger City Go capsule: You don’t have to re-thread the shoulder straps. You can adjust them by squeezing and sliding a mechanism at the back. AMAZING. And because it’s a capsule you just click it out from the base and adjust it before popping it back onto the base. So simple. Especially in the early weeks and months when baby grows so fast. I can tell you after a decade of parenting I’m so glad my youngest is in a booster, because re-threading the straps on car seats is one of my least favourite jobs as a parent. It’s been a while since I’ve installed a capsule base in my car, but working with a friend we managed to get the seat secure and firmly positioned in the car. 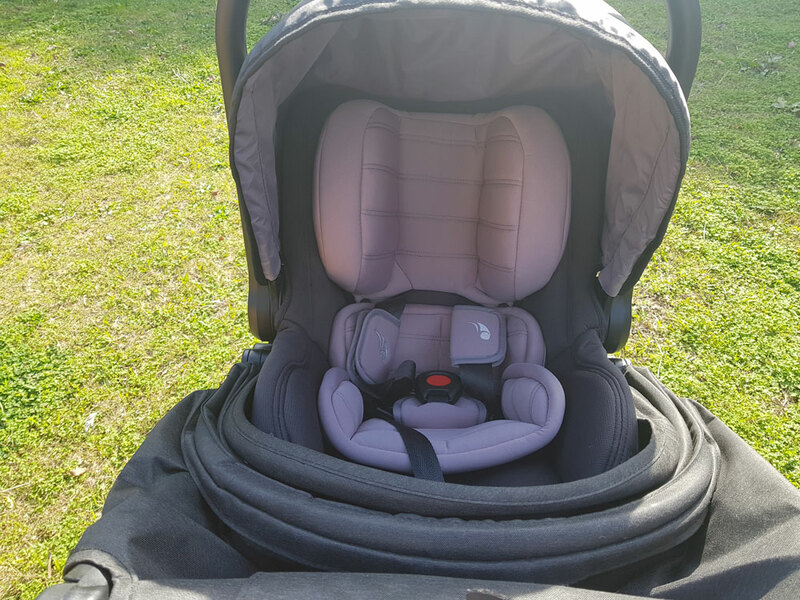 The Baby Jogger City Go has some cool features to make installation easier. There’s an adjustable base with 6 position to fit to the tilt of your back seat. It has a built in spirit level on each side so you can easily see if it’s at the correct angle. Also it has Isofix buckle if that’s an option for installing into your car. I will say though if this is your first baby, or it’s been a while since you’ve installed a car seat into your car, it’s worth getting a professional car seat installer to fit it into your car the first time. That way you know it’s done correctly, so you know what it’s supposed to look and feel like. And also they can give you some tips on what to look for if you ever need to take it in and out of your car. Also on the topic of taking it in and out of your car, you can also purchase a second base separately. So you can use the same capsule in multple cars without having to constantly take the base in and out. I really like the feel of the fabric in the Baby Jogger City Go Baby Capsule. It’s soft and well cushioned. There’s also additional removable cushioning for your newborn. The hood on the seat is really quite large, and perfect for when you’re using the Go Baby Capsule as part of a travel system with a pram. However I did find the hood a little stiff and awkward for folding down. The Go Baby Capsule is approved for aircraft use. So you can take it with you when you fly. Which would be perfect if you pair it with a Baby Jogger City Tour Lux- which is a pram that’s so compact it may fits in the overhead locker on a plane (confirm this with your airline before you fly!). Making it the ultimate travel system! I also love that when you pair the Go Baby Capsule you get a parent facing seat for your new baby, that you may not have had with most Baby Jogger prams. So I really think that’s another huge advantage of pairing them up as a travel system. Overall it’s a really sweet and simple to use capsule. And I’d definitely recommend if you’re wanting to turn your Baby Jogger pram into a complete travel system.